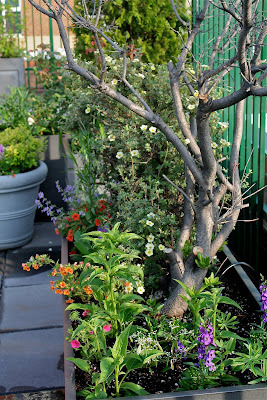 Garden Bytes from the Big Apple: WANTED: DEAD OR ALIVE! Am I patient or just lazy? I prefer the more positive spin. When I transplanted everything on my rooftop into new containers this spring, I lost only one shrub, this Northern bayberry (Myrica pensylvanica) that was one of a stalwart pair. The other was thriving in the next big planter. As you can see, I planted annuals and perennials around the dead bayberry, knowing I might have to rip everything up eventually. My excuse was that the bare branches had a nice architectural quality. Among my closest friends I'm known as the Queen of Denial. Two months later, sprouts emerged from the base of the trunk, and in a few scattered places along the branches. Despite strong complaints from our resident Realtor who thinks a dead tree will make it harder to sell an apartment, I'm waiting and watching. This shrub is not dead. Nor was the southern magnolia that I just had to have on my farm, after admiring the bright pink cones with vermilion seeds at Longwood Gardens. This despite my farm was in zone 5 and I knew the species I planted was labeled hardy only to zone 6. It grew well for four years, then one spring refused to sprout. I left that dead tree in place, watching it daily from my sun-porch, (this was laziness for sure.) Then after THREE YEARS It suddenly leafed out and was reliable year after year. I tend the four tree wells in front of my building; there are Pin Oaks in the center of each, planted by the NYC Dept. of streets. Over a period of three years, one of the trees started to fail, then die; all twigs were brittle with no green inside. Spring 2010 I notified the City. They examined the tree. They sent the chipper shredder. Here's what was left of the 16' Pin Oak on May 25. And here's what appeared on July 12th. Double click on the image and see the leaf sprouts coming up around the stump. 1. Shall I cancel the order for stump removal and a new tree at the Dept. of Streets? 2. How long will it take these sprouts to grow into a tree? 3. Shall I select one sprout and let that develop into a single trunk? 4.Will building resident demand a new TREE? 5. If they do will I succumb to pressure? 6. Do giant oaks from cut-off stumps grow? 7. Will I live long enough to see it all happen? Love the sprouts in the tree trunk. 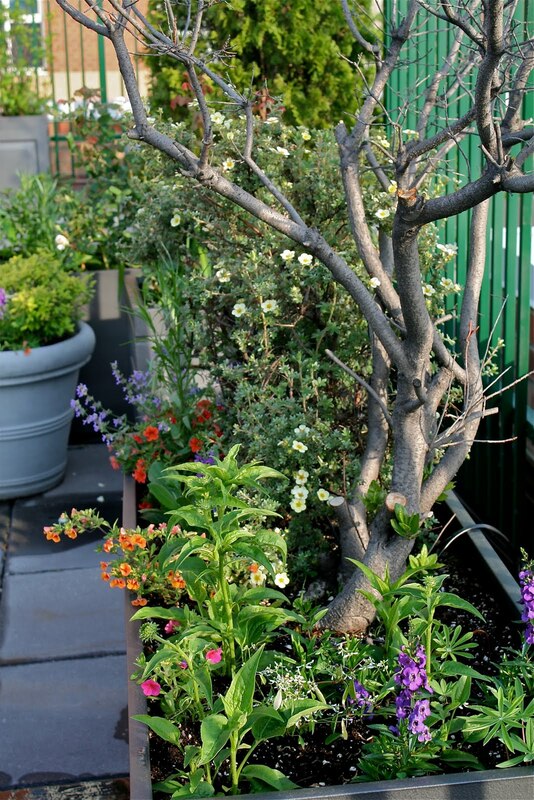 Instead of worrying that this will negatively affect apartment sales, the realtor should be applauding all your fantastic gardening efforts--all enhancing the value of the building, not to mention the living experience! In Hanover, NH, I lost a young yellowwood tree to cold/damp? But a year or 2 went by, the flat stump sprouted a few stems. I selected one sprout to save and so far, it has worked--it's about 7 feet tall! Warmer winters have helped too. Quite honestly, I cannot give you an answer with regard to whether the sprouts would be as healthy/strong as the parent plant. Could you find an answer on-line or from a nursery? Pin Oaks have a strong leader, almost like several conifers. I believe that once the leader (or terminal bud) has been cut, and in this case it surely has, you will get a tangle of weaker stems shooting up from the base, competing with each other for dominance. They will grow, but not in the typical tree form we all are used to -especially as street trees. Over time, they will become a cluster of strong stemmed pin oaks, connected by the same root. It's similar to coppiced trees, although unintentional, or even when the leader dies, and the suckers sprout in a natural woodland setting. I honor your patience, and love to save plants -respecting their perseverance. Will the average person-probably not so much. They'll probably want that single stem.